I can't even believe it. I've learned to love audiobooks this year (what would my errands be like without a good book to listen to), but I unfortunately came across two I couldn't complete. I debated on posting it out in the blogosphere since I didn't finish them, but hey, this is also a personal rant site at times, so why not? Here are the brief reasons why I couldn't finish The American Heiress and Moneyball. Let me also make sure to note that these are my own opinions and certainly do not represent the love that fans have for these two stories. I'm just an odd duck sometimes. 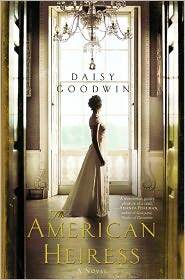 The American Heiress, by Daisy Goodwin. I can't tell you how much I wanted to like this one. I love historical fiction, but... It's 1893 and Cora Cash is the richest American heiress and her mother wants Cora to marry an appropriate man, one with a title. After a trip to England, Cora meets the Duke of Wareham and they get married in a lavish wedding in New York. Upon her return to England, Cora begins to realize that her only true friend is her maid, Bertha, who is also an outsider. This is going to sound silly, but right out the gate, I was a little annoyed by the characters' names. The richest heiress' last name is Cash? The maid's name is Bertha? I just couldn't get into the story. And *mini-spoiler alert for this paragraph* when the story opened up with Cora wanting to be ready to kiss her love interest at the party that night, she enlists her maid to "show her how." It was intended to be shocking, but I thought it was going for the cheap "thrill." Guys, you know I love historical fiction. But this one just didn't do it for me at all. My thoughts on the audio? The narrator certainly carried off the snobbish accent of the turn of the century, but it wasn't the most enjoyable for me to listen to. Moneyball: The Art of Winning the Unfair Game, by Michael Lewis. Okay, bottom line, let me first put the disclaimer out there that I love sports, and I love sports stories. I most especially love the science behind sports. Moneyball is about how one man led the change at the Oakland Athletics on how players are selected. With his team of "geek statisticians," Billy Beane revolutionized the old way of baseball recruiters and didn't opt for the large payroll. Go for the guys who can get on base, even if they don't "look like" a "real" baseball player. In fact, they called Kevin Youkilis from the Boston Red Sox fat, for cryin' out loud, but they knew he could get on base. The old school recruiters liked the traditional look of a baseball player, but Beane and his geeks pushed to bring "others" to the team. Consequently, the Oakland Athletics had one of the lowest payrolls at the time for baseball, but had one of the best records. Sounds completely fascinating for a geek like me, right? Moneyball, though, is a whole heck of a lot of stats about baseball, and if you are not a baseball nut (meaning not just a sports fan, but a baseball NUT that knows obscure facts and stats), it is a struggle to get into this story and understand what is happening. I also kept waiting for a storyline to pick up, but quite frankly, it jumped from one reason to another of why Billy Beane changed the recruiting philosophy of baseball. To me, it felt like a legal case: it was one fact after another, further evidence of why Billy Beane was the man. My husband did end up finishing it, but he's a baseball nut. He did reassure me that it was extremely difficult, though and a lot of events passed him by, too. I felt a little better that it wasn't just me. 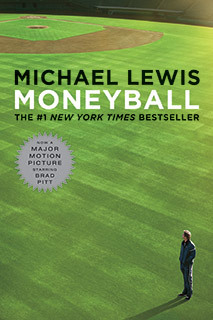 Moneyball is for the pure baseball fan who doesn't really like a lot of story, but likes a whole lot of facts, stats, and events. My thoughts on the audio? Unfortunately, even the phenomenal Scott Brick couldn't help me get into this one. I can totally appreciate why you couldn't finish either of these books -- even though I had a blast with The American Heiress, I can see how listening to it could be a bit maddening -- it was a very over-the-top novel (like you pointed out, the names alone were crazy!). It worked for me, but I also find reading allows me to zip ahead if something doesn't work, unlike an audio book. I'm glad you shared your thoughts! I love audio books too, but some books just don't translate well on audio. Too bad you ran across a couple like that. I don't think I would have got on well with these two books either, for many of the reasons that you mention. I have had a couple of audio flops this year too, and it's always so discouraging to me. I guess there are just some books that aren't favorites, no matter what the format! Thanks for being so candid about it all though! American Heiress is not my speed at ALL, but I almost picked up Moneyball (you know, that "read the book before you see the movie" mentality I have!). I love, love, love baseball stories too, but it's a shame this one doesn't work. This might just be a case of the movie out-doing the book?? Thank you for your honesty! i'm glad you decided to post about these two books! Given your descriptions, I'm pretty sure I would've taken issue with both of these for various reasons. Of course, I've also been in a massive reading slump. Ack! Oh, I've heard great things about American Heiress. I'm not much for audio books. Do you think it would be better after reading? Also, I thought Bertha may be a popular name during the time period, and I looked it up. http://www.ssa.gov/oact/babynames/decades/names1890s.html Apparently it was. The Goodwin book has a great synopsis but I feel like the reviews for it have been pretty negative, so thus far I haven't picked it up! When I was young I MADE myself finish every book I started, but now when I find myself rolling my eyes during a read or a listen, I cut my losses and end it immediately. Huh. Well, I will take note of this. Just read another review of the Heiress one and was just about to see if my library had it on audio. And Michael Lewis is so loved for his books. That is a big bummer. But there is nothing worse than listening to a bunch of stats on audio. You should totally forgive yourself! Silly names and cheap 'shocks' bug the stuffin' out of me, too. I think it's why I can't get around a Dickens novel because he uses such goofy names. ugh. can't do it. On to the next book, I say! Ewww sounds like the first one would annoy me too. Thanks for sharing why they didn't work for you doll! I hadn't planned to read either of them, and I do believe I've made the right choice. Especially Moneyball...sounds like quite the snoozer. Audio depends so much on a great read - and a great narrator.... I love audio and have come to really appreciate good ones. That's a bummer about Moneyball, I'm hoping to read that one. Do you think it would be better in print rather than audio? I didn't like the Goodwin book either. Promised so much and didn't deliver for me. Natalie, this excellent post made me realize I need to do this more often -- explain why I don't finish books, as well as explaining why I love the books I do. Both of these are on my TBR, but I've moved them both down the list a bit, based on your insights. I think I'd probably agree, especially when it comes to Moneyball. I had trouble with American Heiress too. It was okay for the most part, but then I made it all the way through and was disappointed by the ending. So, you didn't miss much by not finishing it. Thats funny that the The American Heiress is called My Last Duchess in the UK. I have heard such lackluster reviews for this one that I have never been tempted by it. Bummer, I hate when I can't finish a book but there are so many great ones out there that it doesn't make sense to waste tome on the ones you can't love.